Note: Due to terror attacks and the influx of refugees, some countries like Germany, Denmark, Sweden, Austria, Norway, and France have applied tighter checks on their borders. Normally those eligible to travel across borders (i.e. EEA nationals and those with valid Schengen visas) should be able to do so but must expect a longer wait and bring all travel documents to prove eligibility (e.g. passport, Schengen visa) when transiting via land or sea until the situation abates. Europe is a continent that is relatively small but with many independent countries. Under normal circumstances, travelling through multiple countries would mean having to go through visa applications and passport control multiple times. The Schengen zone, however, works somewhat like one country in this respect. As long as you stay in this zone, you can generally cross borders without going through passport control checkpoints again. Similarly, by having a Schengen visa, you do not need to apply for visas to each of the Schengen member countries separately, hence saving time, money and paperwork. Countries of the Schengen Zone include Austria, Belgium, Czech Republic, Denmark, Estonia, Finland, France, Germany, Greece, Hungary, Iceland, Italy, Latvia, Liechtenstein, Lithuania, Luxembourg, Malta, Netherlands, Norway, Poland, Portugal, Slovakia, Slovenia, Spain, Sweden, and Switzerland. Romania, Bulgaria, and Croatia are EU member states that are not yet formally participating in the Schengen scheme. They maintain separate passport control checks at border crossings with Schengen states. However, holders of a valid Schengen visa may be able to enter those states without applying for a separate visa. The microstates Monaco, San Marino and Vatican City are not part of the Schengen Area and have differing formal relationships with it, but they all have open borders with neighbouring Schengen countries and can be legally entered with a Schengen visa. Andorra has no formal agreement with the Schengen Area and maintains permanent border controls, but does not issue its own visas. Instead, Andorra accepts a Schengen visa. Going back from Andorra might need a multi-entry visa, since entering and leaving Andorra could be the same as leaving and re-entering the Schengen Area. In practice passport control at the Andorran border is relaxed and unlikely to cause problems for most travellers, but you should still say in your visa application if you intend to visit Andorra. Gibraltar is not part of the Schengen Area and maintains permanent border controls, and entering Gibraltar from the Schengen area will invalidate a single-entry Schengen visa. In practice, however, passports are only given a cursory check but not stamped at the land border with Spain, and visitors with single-entry Schengen visas who enter and leave through that border crossing are usually re-admitted to Spain without any problems. If required for your nationality, ensure that you have a visa for Gibraltar as you will still be denied entry otherwise. This arrangement does not apply if entering or leaving Gibraltar by air, and you must have a multiple entry Schengen visa should you wish to fly into Gibraltar and re-enter the Schengen area. The Schengen Area is not the same as the European Union (EU). Not all EU countries are part of the Schengen zone and not all Schengen countries are part of the EU. As such, when you as a non-EU citizen go to an EU member state that does not participate in the Schengen agreement, you will be subject to their completely separate visa, entry requirements and passport control systems. The most notable examples of EU non-Schengen members are the United Kingdom and Ireland. Newer EU member states Bulgaria, Croatia, Cyprus and Romania are not part of the Schengen zone but are expected to join. Norway, Switzerland and Liechtenstein are examples of Schengen zone members that do not belong to the EU. For EU citizens the Schengen Zone is of somewhat less importance, as there is the related but separate concept of free movement inside the EU. The Schengen Zone only covers immigration controls, whilst the EU is effectively a customs union. Therefore, you do not need to pass through customs when travelling between a Schengen and a non-Schengen EU country, but you will need to pass through immigration controls (e.g. UK to Germany or vice versa). The converse is true for travel between EU and non-EU Schengen countries: you must pass through customs, at least if you have goods to declare, but not immigration (e.g. Switzerland to France or vice versa). A Schengen visa and visa-free travel to the Schengen area (for eligible non-EEA and non-Swiss nationals) is valid for only short stays (those that are 90 days or less within a 180-day period – for all the area). Any non-EEA or Swiss national who wishes to stay for a longer period must apply for an appropriate long stay national visa, which is valid for a particular country only. Moreover, a Schengen visa might not be valid to visit overseas territories of a particular Schengen country (e.g. French overseas territories or Greenland). This article has focus on short stay tourist, family visit and business visit visas as well as visits to the Schengen zone for the said purposes. 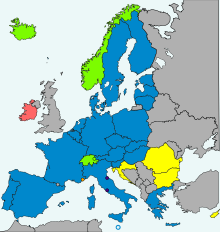 Other EU members outside Schengen Area but bound by same visa policy and special territories of the EU and Schengen member states. Citizens of the European Economic Area (EU, Iceland, Norway and Liechtenstein) and Switzerland only need a valid national identity card or passport, they do not need a visa for the Schengen Area and are generally allowed to stay for as long as they want. Non-EEA nationals who normally need a Schengen visa, yet have a residence permit/long-stay national visa in one of the Schengen countries generally do not need to apply for another Schengen visa to visit the other Schengen countries for the duration of their residence period. However, their visit in the other Schengen area countries will still be limited to the standard 90-day per 180-day period. Work or residence rights are also not extended outside the country that issued this long-stay visa. Citizens of 12 countries need a transit visa even for airside transits: Afghanistan, Bangladesh, Democratic Republic of the Congo, Eritrea, Ethiopia, Ghana, Iran, Iraq, Nigeria, Pakistan, Somalia and Sri Lanka. Everyone else is allowed to change planes at an airport in the Schengen area without obtaining a visa. However, if the airport you are transferring to is in the Schengen area as well or you intend to leave the "airside" area of the transit airport, this means you're entering the Schengen area and the rules above apply. This also applies if you have a flight within the Schengen area as part of an itinerary beginning and ending outside it: For instance, an Indian citizen traveling from Mumbai to New York with stops in Paris and Amsterdam would need a Schengen visa because the Paris-Amsterdam flight cannot be accessed without entering the Schengen area. Completed application form (the form can be downloaded from the website of the embassy concerned) and some member states may also request you to fill-out an additional form. Parents will need to sign the application form of minors whether they will accompany them or not. The fees must usually be paid in the local currency equivalent (the exact/actual amount as well as acceptable modes of payment will be specified by the embassy/consulate concerned). If the embassy/consulate outsources the administrative aspects of the application to a third party (e.g., to VFS), then a fee may be charged by these third parties in addition to the above fees. For those applying in a country where they are not a citizen of but have legal residence: Residence permit which must be valid for at least three months from the day you return. Minors who are travelling alone (or with an adult who is not a family member) and in some cases with only one parent may need to secure a permit to travel form or its local equivalent from local authorities in their home or resident country signed by the parents or legal guardian who is not accompanying the minor. This requirement depends on the local laws. Employment certificate and recent payslips (if employed), or enrolment certificate/letter from institution (if a student). As much as possible, they should state the period in which you are allowed to go on holiday or business trip. In some cases, if you are unemployed or a dependant on someone else financially, you will have to procure an affidavit of support and/or a declaration form. Bank statements covering the last 3 months prior to the application. The specific amount required to be in the balance depends on the member state whose embassy you are applying at (typically €40-60 per day per applicant on your party plus enough to cover unpaid ticket costs, accommodations, pre-booked tours). In case you do not have a bank account, traveller’s cheques might be accepted by some embassies. If available or applicable, any other evidence that shows your strong motivation to return to your country of citizenship or legal residence at the end of your trip, e.g. property titles, tax returns, share certificates. Confirmation of accommodation arrangements. These have to establish that the country whose embassy you're applying at is your main destination (see next section). For tourists staying at a hotel/hostel, your confirmed bookings. If you intend to stay with friends/relatives, they may need to course their invitation through local authorities, fill-in official paperwork and post it to you. Official letter/invitation from organisers/sponsors, if you are on a business trip or conference. Travel insurance that covers at least the entire Schengen Zone for the duration of your trip and at least €30,000 in emergency treatment and medical repatriation. Do not submit original copies of the above-mentioned documents to the application centre as they may not be returned to you (except the passport of course). The application form may have an option of whether you want a single or multiple entry visa. However, the latter is rarely granted for first-time visitors and not all countries grant it at all unless you can demonstrate that in between two Schengen states, you intend to visit a non-Schengen country. In applying for a Schengen visa, there is no such thing as applying at the embassy/consulate/visa application centre of your choice. The embassy/consulate/application centre at which you must apply will depend on where you plan to actually go, how long you plan to spend in each of the states, and what the main purpose of your trip is. If you only intend to visit one country, then you must go to the designated application centre for that particular country. Don't visit the visa application centre for Spain if you will only visit Austria; go to the visa application centre servicing Austria. If you intend to visit more than one country, then you must identify the country which is your main destination . A main destination is defined as the destination where you will spend the longest time in if the purpose of your trip is the same for each of the countries you will visit, or where the main purpose of your trip will take place if you have more than one purpose. Your main purpose will also depend on the visa you are ultimately applying for. For example, if your itinerary says you will spend 2 days in Germany, 4 days in Sweden, 3 days in Poland and 1 day in Belgium all for a holiday, you need to apply for a visa at the Swedish embassy/consulate. If you will spend 5 days in France for a holiday but you will do this after attending a 3-day conference in Italy, you must go to the Italian embassy. If there is no clear main destination and the purpose of your trip is the same everywhere, that is you will spend almost exactly the same amount of time in each member state then you should lodge your application at the application centre of the member state where you intend to first arrive at. For example you will enter through France and spend 3 days there, then 3 days each in Denmark and finally Switzerland all for a holiday; you must go to the French consulate/embassy for the visa. Generally speaking, you can only apply at the application centre that has jurisdiction over the country (and possibly city) where you live. If you are a temporary visitor in a third country, you cannot apply for a Schengen visa there. You will need to present proof of residence in a third country in order to apply for a visa there. Check the relevant embassy's website for more details on how to set an appointment, where you need to go, and what else you need to bring. In rare cases, if a member state has no mission in your home country, the embassy you need to visit is in an other country, serving also your area. The relevant embassy may also be that of an other Schengen country, accepting and possibly processing applications on behalf of the Schengen country to which you intend to lodge your application. Get all your paperwork in order as early as possible, especially if it takes days to process or needs to be posted to you. Personal appearance is generally required and is usually by appointment only; walk-ins are only allowed in a few cases. Appointment slots run out quickly so book an appointment early. The application may be filed up to three months in advance of your scheduled trip. In general, personal appearance at the application centre is required; that is, an agent cannot lodge the application on your behalf. Make sure you be at the application centre at least 15 minutes before your appointment and that your documents are in order. The staff at the window will inspect your documents, ask routine questions about your trip, collect the application fee, and normally take biometric fingerprints and digital photographs. If your documents are insufficient or out of order, or you are requested to submit more, then you will usually need to make a new appointment. Your application will not be processed until this is satisfied. Processing time depends on a variety of factors. They include the applicant's nationality (some nationalities are subject to consultation with other member states), purpose of visit, time of the year, outstanding documentation, referral of application to different government departments, and staffing levels at the embassy. Before the appointment is over, the application centre will advise you on when and how you can claim your passport (either by returning personally or by post). If you receive a Schengen visa, make sure you check to see the information is correct. In particular, check that the visa says something to the effect of "valid for the Schengen States" (usually written in the language used by the embassy that issued the visa; for example, États Schengen). The validity dates must match your original travel dates and not expire earlier. Contact the application centre immediately if you notice any discrepancies (even if you applied for a multiple-entry visa, the consul may still grant a single entry visa). If your application is unsuccessful, you'll normally be given a notice explaining the reasons for such a decision. The process and grounds for appeal vary between each embassy/consulate but you are strongly advised to refer to the notice and address the issues outlined before returning to the embassy. Unless the refusal notice states that you are ineligible to apply for a certain amount of time, you can lodge a new application at any time (with a corresponding fee), but make sure you address the issues that caused your previous application to fail. Keep copies of the documents you used in your application and those that will establish your purpose of visit, and be sure to bring them with you as border officers may ask to see them upon your arrival. If you have been issued a Schengen visa but later you have been notified that the main purpose for your visit no longer exists (e.g. the conference you are scheduled to attend has been cancelled) yet you still want to pursue your trip to the other countries, then you may need to inform the embassy that issued you the visa about the change in circumstance and apply for a new visa with the pertinent embassy. Pay particular attention to the validity dates and length of stay: make sure to leave before they expire (whichever comes earlier/first). The validity dates simply provide the window in which you can travel to the Schengen area. If you decide to postpone and shorten your trip however, the original expiry date will still stand and you must still exit on or before this date even if the allowed number of days stated in your visa won't be totally used up by this date. The maximum 90 days in 180 is counted in a moving window of 180 days. If you stayed the 90 days at the end of your previous 180 days, you are not allowed to re-enter before 90 days have elapsed. If your previous stay was shorter you are allowed to re-enter immediately, but have to leave before the recent days of your last stay and the days of your current stay add up to 90 (in the past 180 days). If you were given a multiple-entry visa, the number of days indicated on the visa will refer to the total amount of time you can spend in the Schengen area, regardless of the number of entries you plan to make or are allowed to make, in a six-month period or the period stated in the visa – whichever is shorter. Hence, if you are given a multiple-entry visa valid for three months but the length stay only allows 10 days, the 10 days won't be reset by you leaving the Schengen zone and returning later. In this case, if you stayed for 4 days on your initial visit but wish to come back while the visa is still valid, you can only return for a maximum of 6 days on that visa. Arrival and departure dates are included in the number of days you have stayed in the Schengen zone, regardless of actual arrival and departure time, so plan accordingly to maximize time. Likewise, if you were only given a single entry visa for 30 days but have decided to cut your trip short by leaving only 20 days into your trip, you can no longer use that same visa any more and the remaining days you have left on that visa are forfeited (though this will not be taken against you when you apply for another visa in the future since you did not overstay). If you wish to visit non-Schengen states (e.g. UK, Ireland, Romania, Bulgaria) in between two Schengen states, make it clear in your application that you need to do so (though you may also wish to visit such non-Schengen states only before entry or after visiting the Schengen zone). If you have been issued a multiple-entry C visa with a long validity period (i.e. more than 6 months) or several single-entry visas, please be aware that you are only allowed a combined maximum stay of 90 days within a 180-day period in the Schengen area. Some countries within the Schengen area, such as Spain and Portugal, offer an extension to the Schengen visa (or to the right to stay), valid for that country only. This allows staying longer than the 90 days period in the Schengen area without getting a long term visa. The extension requires a valid reason and the usual paperwork on sufficient funds etc. You might have to leave without entering any other Schengen country, as they probably will count your extended stay as part of the 90 allowed days. Unlike in most other countries, incoming passengers are normally not required to fill-in any additional paperwork to present to passport control officials. Just like with other visas, a Schengen visa does not automatically entitle you to enter the Schengen area. As such, you must still demonstrate to passport control officers that you are genuinely entitled to the visa you were issued. Even if you possess a valid visa, actual entry may still be denied/refused if you are unable to satisfy the border officer's questions and/or requests to see documents. At most checkpoints, two sets of lanes are provided: one for EEA/Swiss nationals and another for all other passport holders. In some countries, the main airports may also provide a premium lane for eligible passengers (usually those who travel in first and business class); your airline will hand you a voucher which you will show to the staff upon arrival (ask your airline for more information). Non-EEA travellers need to provide their biometric fingerprints at the point of entry. When travelling through a Schengen airport, flights are separated into Schengen and non-Schengen flights, similar to domestic and international flights elsewhere. This means if your flight originates from a non-Schengen country but are connecting via a Schengen airport to another Schengen country (or vice-versa), you must clear passport control at the first (or last) airport you travel through within the Schengen area. When a connection is inevitable, consider the connection times and the potential for queues when booking your flights. If you are a non-EU/EFTA national (even if you are visa-exempt, unless you are Andorran, Monégasque or San Marinese), make sure that your passport is clearly stamped both when you enter and leave the Schengen Area with all the pertinent dates visible. Without an entry stamp, you may be treated as an overstayer when you try to leave the Schengen Area; without an exit stamp, you may be refused entry the next time you seek to enter the Schengen Area as you may be deemed to have overstayed on your previous visit too. For those who need another visa in the future, the application may be refused or the processing of your application may experience further prolonged processing. If you cannot obtain a passport stamp or the ink is not too visible, make sure that you retain documents such as boarding passes, stamps of passports from other countries, transport tickets, financial documents, attendance records at work/school, which may help to convince border inspection staff that you have stayed in the Schengen Area legally. Do not assume that border officers at the Schengen area states have access to the database of other member states (they generally don't). Make sure to get a stamp put into your passport. Once you are allowed into the Schengen zone, you can generally travel to any member state without going through formal passport control procedures again. When using a plane to travel between two airports within the Schengen area, it will be as if you are taking a domestic flight. However, some countries like France, Italy and the Netherlands require non-EU/EEA/Swiss nationals to declare their presence to relevant local authorities even if they arrived from another Schengen member state. This may be taken care of by the accommodation you are staying at upon check-in, but otherwise you will have to visit the relevant authorities yourselves. Consult the Wikivoyage pages of the individual countries as well as the websites of their respective immigration authorities for more information. The Schengen agreement also has provisions for allowing individual member states to temporarily reinstate border controls in certain circumstances. For instance, as a result of a 2015-2016 influx of refugees, train passengers in Denmark headed for Sweden had to briefly alight at the Copenhagen Airport station for a passport check before continuing their journey. In addition, expect random passport checks when crossing borders at any time, as well as when boarding a plane at the airport. Hence, even if there are no border (immigration) controls between Schengen states, you are 'strongly advised to carry your passport: with you when crossing borders between Schengen states. Norway, Switzerland, Iceland, and Liechtenstein, while in the Schengen area, are not in the European Union and, accordingly, customs controls are in effect for all arriving travellers, regardless of point of origin. On some borders the controls are lax and you may have to yourself make sure to find a customs official to declare goods needing customs clearance. Åland, while a member of the EU and Schengen as part of Finland, is not a member of the tax union and you should thus declare some imports, even when there is no customs where you happen to pass the border. Similar considerations apply to the Channel Islands and some other areas. When crossing the border by train, customs officers may enter the train; and when crossing by car, customs officers may stop your vehicle and inspect it. It is possible that inspections may happen twice in a single journey: once by the customs officers of the outgoing country and another by the customs officers of the incoming country. Normally, if transiting through an airport in one of these four countries, you may not be required to clear customs in the transiting airport. Finally, even within EU-Schengen states where customs checks are not carried out on importing or exporting goods, customs authorities of individual EU-Schengen states may still carry out checks to ensure that prohibited or controlled items (e.g., illegal drugs, firearms) are not transported across the border. This travel topic about Travelling around the Schengen Area is a usable article. It touches on all the major areas of the topic. An adventurous person could use this article, but please feel free to improve it by editing the page.